While Hindu outfits like Vishwa Hindu Parishad observed December 6 as "Shaurya Diwas" meaning day of bravery and "Vijay Diwas" meaning day of victory, Muslim organisations commemorated the day as "Yaum-E-Gham" meaning the day of sorrow. New Delhi (Sputnik): Ahead of the election year, with religious matters fast taking on political hues, a nervous Indian government put to play all its security apparatus to ensure the peaceful passage of the 26th anniversary of the infamous Babri Mosque demolition on Thursday. The mosque named after the first Mughal emperor of India Babur was demolished 26 years ago December 6 by right-wing activists who contended that the site originally belonged to an ancient Hindu temple. The site still remains disputed with a case in the apex court. Nevertheless, Hindu outfits mark December 6 as a day of triumph. This year too, Hindu outfits across the country reportedly observed the day with fireworks and festive fervor. 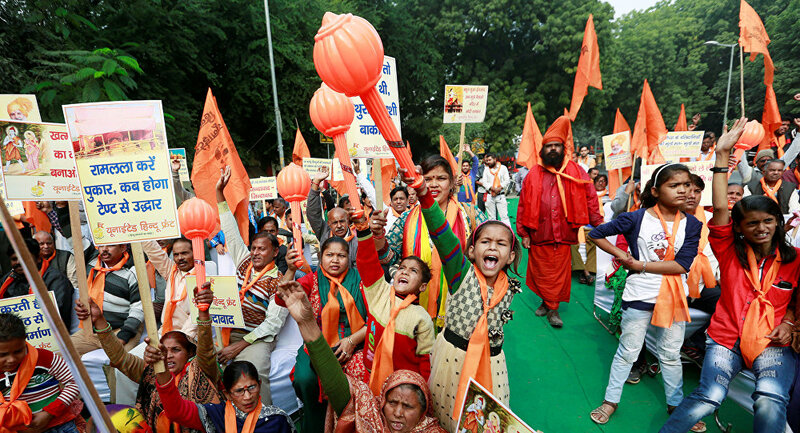 The biggest celebration was witnessed in Ayodhya, Uttar Pradesh by right-wing cadres who believe the structure stood at a place where Lord Ram, the Hindu God was born. Security was beefed up across Ayodhya and the international border of Uttar Pradesh with neighbouring Nepal. The situation was particularly tense in Uttar Pradesh this year with a major clash breaking out between right-wing organisations and the police on Monday. The groups were protesting the discovery of a cow carcass from the jungles adjacent to Bulandshahr. A police officer and a youth were killed in the clash, posing a great threat to communal peace and security situation in the region. Social activists say the modus operandi of playing one community against the other is a popular strategy of politicians in India. "This is not new. It happened even before the 2014 parliamentary elections. It is easy to flare up the majority sentiments and make them fight the minority community. The sense of fear in the minority community is then converted into precious votes. This time cow seems to be one of the agendas", Arvind Murti, social and civil rights activist in Lucknow told Sputnik. The majority of Hindus in India consider the cow to be an incarnation of God and pious. Since the Narendra Modi government, with the support of Hindu nationalists, came to power in 2014, a lot of politics has been centered around the protection of the cow and punishing those involved in the slaughter of cows. According to news agency PTI, over 2,500 personnel from the Rapid Action Force (RAF), Central Police Reserve Force and other paramilitary forces were deployed across the city of Ayodhya on Thursday to avert communal violence. "Peace and harmony in the state is our highest priority and we are with people who are working to promote brotherhood among people. The government must be appreciated as it dealt with such delicate situation sternly", Shreekant Sharma, a Minister in the Uttar Pradesh government told Sputnik.